The Endocrine Society’s Hormone Health Network does such a fine job explaining, I won’t recreate the wheel to much. Check out their “adrenal fatigue” page! Fatigue is also real, so if somebody has convinced you that you have “adrenal fatigue,” be sure to see a physician for a legitimate evaluation as the cause can range from poor sleep, stress, etc to real hormone disorders (thyroid, real adrenal problems, hypogonadism, etc), anemias, or other deficiencies. Endocrine news recently published a great article directed toward clinicians but I think is worth the read for patients too. 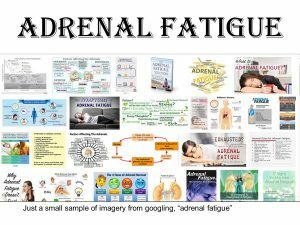 Describes the myth of “adrenal fatigue” while using the discussion as an opportunity to evaluate what is actually going on.